Basilica Of Bom Jesus Visitors from India and overseas flock to the Basilica of Bom Jesus in Old Goa, built in 1605, and A Church in Goanow declared a World Heritage Monument. The church houses the sacred relics of St. Francis Xavier, patron saint of Goa, who died while on a sea voyage to China on December 2, 1552. The following year, while transferring his remains to Goa, in accordance with his wishes, it was found that the saint's body was as fresh as the day it was buried. This miraculous phenomenon continues to attract the devout from all lands, and an Exposition or public viewing of his body every ten years attracts lakhs of pilgrims. 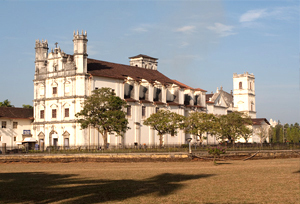 During the 450 years of Portuguese rule in Goa, St. Francis Xavier was believed to have accorded protection to the rulers who handed over their symbols of office to the saint during every changeover of the office of Governor General. The Saint had miraculous healing powers which were experienced by the erstwhile Nizam of Hyderabad when he came for the Exposition of 1878. Se Cathedral The Se Cathedral nearby is dedicated to St. Catherine, as it was on her feast day, 25th November 1510, that Alphonso de Albuquerque conquered Goa. Believers are awe-struck to hear of the Cross of Miracles, which is placed in the cathedral, its earlier church having been destroyed. People have had a vision of Christ on this cross and the rock on which it was found was said to spout water while, today, the Cross is slowly growing. Earlier, it was at Se Cathedral that the sacred relics of St. Francis Xavier were shown to the public. Other Churches Not far away from the Se Cathedral stands the beautiful whitewashed Church of St. Francis of Assisi, which today houses part of the archaeological museum. Exhibits include prehistoric items from a distant tribal past as also reminders of Goa Dourada or Golden Goa. It was the concentration of magnificent churches, symbol of a powerful conquering presence, which justified this last title. In fact, the Church of St. Cajatan, built by an Italian architect in 1651, was modeled in miniature on St. Peter's Basilica in Rome. Today a theological college is housed here. 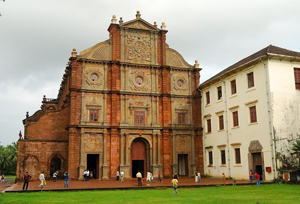 In Velha Goa, or Old Goa, crowning a hill which was known as the Holy hill, is one of the earliest churches, the Church of Our Lady of Rosary. 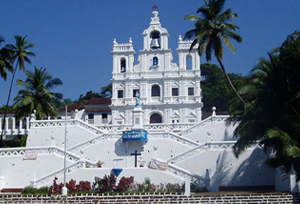 In Panjim or Panaji, as Goa's capital is called today, the oldest church is dedicated to Our Lady of Immaculate Conception. The huge Convent of Santa Monica, dating from 1606, was the first Nunnery in Asia. Today, after centuries of changing fortunes, it has been restored and is once again a residential convent. The Reis Magos Church or Church of the Three Magi Kings, built in 1555, was once a mission center of the Franciscan Order of Monks. Also in Bardez Taluka, at Saligao, amongst picturesque surroundings, stands the Church of Mae de Dens or Mother of God. The statue after whom this church was named once occupied a convent, now no longer extant, and was known for its miraculous powers. This church is a fine instance of Gothic architecture. The Church of St. Alex at Curtorim, too, dates from the 16th century. The Church of St. Anne, at Talaulin Iltias, affectionately called Santana by the people, is dedicated to the Mother of Mary. It is situated on the right bank of the Siridao River. The Rachol Seminary in South Goa has a chequered past. Originally a Muslim fortress, it was first converted by the Portuguese into a church and later into a prison. In the late 16th century, it acquired respectability as a seminary for Theological Studies, with the Jesuits re-christening it from College of All Saints to the College of St. Ignatius Loyola, the name of their founder. While these Catholic institutions have survived the ravages of time, a visit to the ruins of lost churches, of which there are many, would help to discover further the truths of a remarkable period of religious activity on the shores of our country.